Ten million dollar man Jim Furyk is not expecting any charity at Celtic Manor - especially from Padraig Harrington. The American veteran pocketed the massive €7.3m FedEx Cup bonus last week. But he doesn’t expect Europe to be as generous at the US Tour when he tees it up in his seventh Ryder Cup today. Furyk said: “You are not going to get any powder puffs in the Ryder Cup. You’re looking at the 12 best from Europe and the 12 best from the United States. European skipper Colin Montgomerie has been lashed for picking Harrington ahead of Justin Rose or Paul Casey. And while Furyk understands that, he believes the Scot can only be judged by the result on Sunday night. He said: “Paddy has been one of the more dominant European players for quite a few years. Okay, this wasn’t his best year but it wasn’t Tiger’s best year either and they are obviously very solid picks. 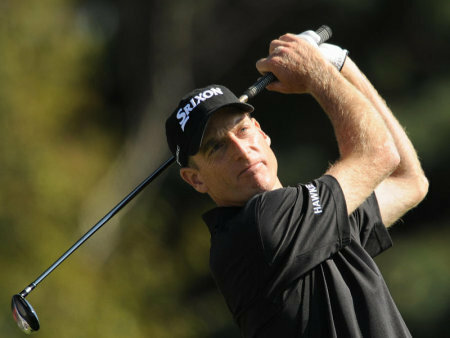 Furyk knows that the US faces a tough task to win the trophy on European soil for the first time since 1993. 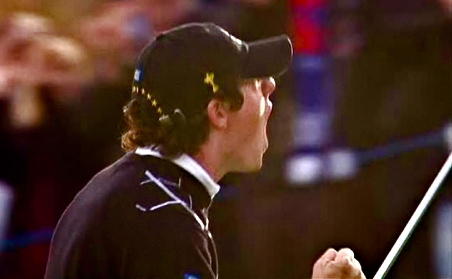 And he doesn’t think the task has been made any easier when Monty can count on rookies like US Tour winner Rory McIlroy. Furyk said: “The Ryder Cup is a special deal but Rory is very mature for 21. He’s in the top 10 in the world, he’s been around the block and he’s won on both sides of the pond. “He’s a guy that everyone expects to contend in a major championship so at that point, you kind of ignore the fact that he’s a rookie. Padraig Harrington reckons Paul McGinley is too young to captain Europe's Ryder Cup side at Celtic Manor in 2010. The US squad will be skippered by pint-sized Corey Pavin but Harrington believes that pocket battleship McGinley, who turns 42 today, will be fighting to claim his fourth Ryder Cup win from four appearances when the matches are played in Wales. While he tipped McGinley as a future European captain, Harrington said: "As a player he is too young and he should be concentrating on making the team. Paul has had a very successful year that has been overshadowed by a really tremendous year for Irish golf and he will continue to build on that. Padraig Harrington believes Colin Montgomerie would make an ideal Ryder Cup captain at Celtic Manor in 2010. After firing a third round 68 that still left him a formidable eight strokes behind Ryder Cup team mate Paul Casey in the Abu Dhabi Championship, the Dubliner explained that appointing the Scot for the matches in Wales would give Europe the best chance of regaining the trophy. Darren Clarke insists that Padraig Harrington is key to Europe’s hopes of winning back the Ryder Cup. Rory McIlroy and Graeme McDowell drew energy from the massive home support as Europe produced a stunning late afternoon comeback to set up a final day thriller at Celtic Manor. The Ulster duo experienced a rollercoaster day as they came out and grabbed a brilliant half with Matt Kuchar and Stewart Cink in the fourballs only to lose sickeningly to the American pair on the 18th in the foursomes. Graeme McDowell looks on as Rory McIlroy birdies the 17th to beat Hunter Mahan and Zach JohnsonGraeme McDowell and Rory McIlroy responded to Monty’s hair-dryer treatment by clobbering the US with a sensational McAttack. Urged by their skipper to hit the Yanks hard, “G-Mac” and “Wee Mac” backed each other up brilliantly to grab their first Ryder Cup win and to set up a heart-thumping singles showdown as Europe stormed from two behind to three points in front at Celtic Manor.